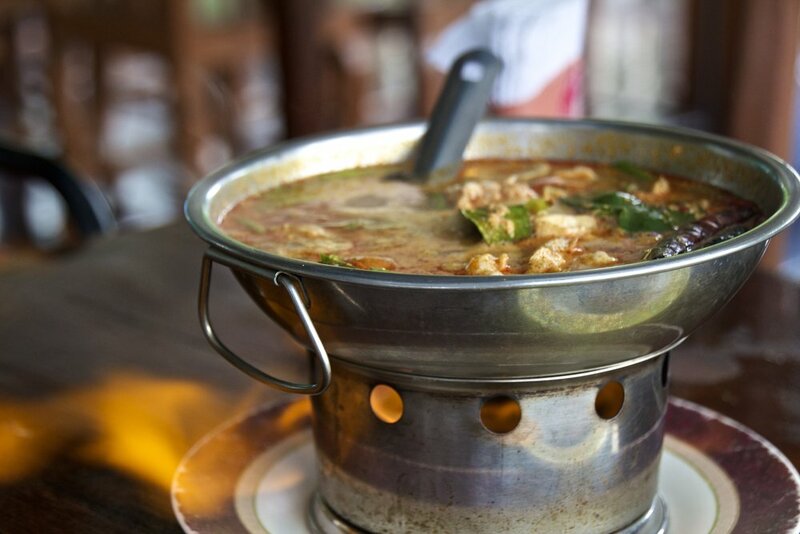 Thailand is known all over the world for, among other things, its food. And I wanted to try some authentic Thai food. “The weirder the better” I told my hosts. They were pretty amused with my antics and sent their maid to the market for some goodies. I would have liked to see the market but I ate all the food just the same. So let’s start the count down of strange foods. We’ll order these according to weirdness and save the weirdest for last. On my first morning in Thailand I was given a glass full of a aqua-blue liquid with ice. This is called Aunchun. It is made from Clitoria Ternatea flowers. Apart from that highly-suggestive scientific classification, it has a number of common names, but probably none you’ve ever heard of seeing as they are indigenous to Asia. The drink tasted okay. I really don’t know how to describe it but it wasn’t bad. I was informed that it is also common to just straight up eat the flower. So I ate the flower too. The pedals didn’t have a very strong flavor; they tasted like leaves in a salad. When a lemon is squeezed into the drink it instantly turns purple. It was like something from chemistry class. I don’t know what the reaction is that takes place but it tasted very different with the lemon. I think I preferred it. Somewhere between a crawdad and lobster, the river prawn is an extremely overgrown shrimp. It’s Jurassic Park shrimp. 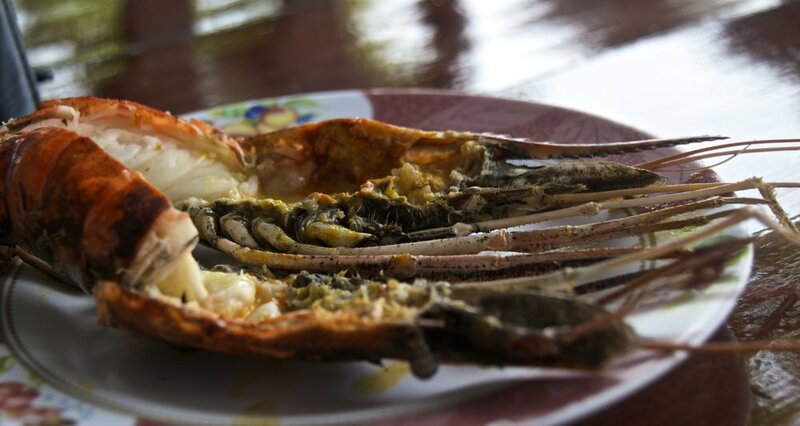 They were served freshly caught and cooked in a restaurant next to the Chao Pra Ya River. They were split down the middle so that the meat in their tales could be pried out with a fork. 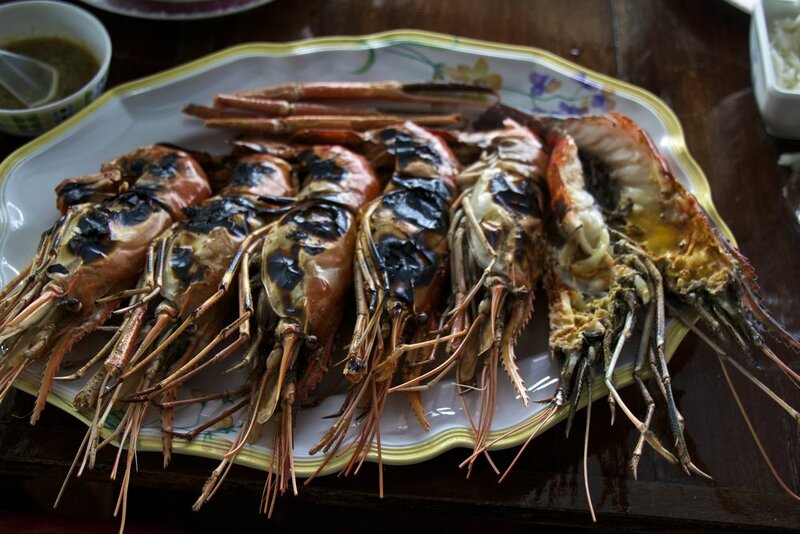 True believers in the River Prawn love the eggs they carry and use them as a condiment. The eggs are an oozing yellow spread that looks like a soupy packet of Dijon mustard when the egg sack in punctured. Supposedly they are very tasty but all I really tasted was the spicy Thai sauces that had been instructed to include. Included in this meal were a variety of other, more normal things, including a hot pot. We were eating outside and it was windy. The wind would catch the flame frequently causing it to leap out surprisingly long distances towards us. Hot pot is pretty normal in Asia but this flame was freaking me out dude, so I thought I'd make a note of it. These were actually really good. The burnt frog feet were pretty creepy at first but the thick thigh muscles were very good. They tasted like chicken. I ate quite a few of these, seeing as they were the most edible things on the table at the time. This one had pros and cons. The body was pretty crunchy, which was good. But the legs were sticky and they went everywhere once I started chewing. I felt like my tongue was wading through a sea of tiny legs. It didn’t have a whole lot of flavor but it wasn’t bad. I’d eat it again. This did not taste good but it was doable. The insides were soft like tiramisu but the outer layer was harder like the skin on a soft grape. Together they had a texture sort of like lumpy pudding and taste that was all its own. One was enough. You know, it actually wasn’t bad. It was a big bowl full of tiny ants and their eggs, all mixed in together. I was grossed out at first when I accidentally forked one of the larva and white goo spurted out like puss from a pimple… but after I pulled myself back together I tried it. And it was good. It was both crunchy (the ants) and juicy (the larva) at the same time. And not even in a weird way. They had been heavily doused in Thai spices so that is most of what I tasted. Okay, it wasn’t really a cockroach. Technically it’s called a horseshoe crab – but it isn’t the type that is found at the beach. It is found in the rice fields, and it was DISGUSTING. Here's a picture - tell me this doesn't look exactly like a cockroach! It was probably the worst thing I’ve ever eaten. They ripped the wings off for me first. Then they told me to put it in my mouth and eat it. There was no further deconstruction to be done. I bit down and it made a loud crunching sound. It was tough and I couldn’t bite through it on the first try. At first it tasted salty. But then the flavor became more intense. It was sourer than an Atomic War Head (candy). Remember those? It was sourer than sour and had a pungent, salty stink that wafted up into my nose making me gag. And I really gagged. I’m gagging over my keyboard right now just thinking about it. I spit it out into my napkin and my hosts all laughed at me. The maid chuckled as she went into the back room with a new horseshoe crab. She came back with a bowl full of ground up bug. This would maybe make it easier to swallow. However, after gagging so violently on it the first time I would need some help. The flavor still clung to my throat. I decided to swallow some of it like a pill. I just wanted to be able to say that I had eaten it. 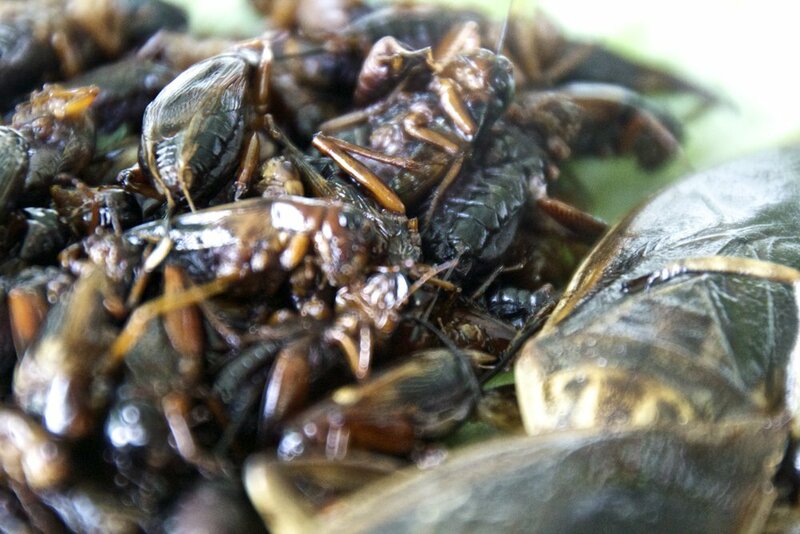 I took a few small pieces of it with some water but bugs are made to stick to things. That’s why they can walk up walls. The shards of creature stuck to the inside of my throat like a roaches legs stick to the wall. I choked but I got it down eventually. I felt pretty accomplished but just then the maid's husband, who was also the family driver, came in, picked up one of these creatures, broke it in half and ate it like a peanut. No faces, no gagging, just a disinterested shrug. By bonus I mean it wasn’t weird at all, but I want to write about it because it was awesome. We picked it up on the side of the road on the outskirts of Bangkok. We got 2 bags. The 1st bag contained a stack of warm, light-green crepes. The 2nd bag contained sugar cane that had been shredded so thinly that it looked like locks of hair. You take some of the sugar cane wrap it up in the crepe and you get a food called Rotee Saimai. It is an awesome snack. If you have some time in Thailand pick some up. It’s tasty and it will hold you over. Whew! That was a lot of new foods. If only 7-year-old Peter could see me now. Turns out green beans were no big deal. Although I still don't like them. P.S. Fun Fact: The word for Guava and the word for white people are the same in Thai.